THE MAGIC NUMBER: INTERSTELLAR RODEO ROLLS OUT ITS LINEUP FOR YEAR SEVEN. 2018 HEADLINERS: FEIST, JULY TALK AND COURTNEY BARNETT. 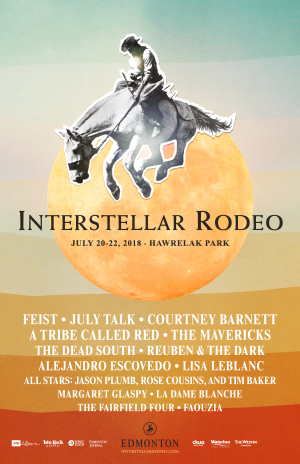 Interstellar Rodeo takes place July 20-22, 2018 at Hawrelak Park. The 2018 Interstellar Rodeo Edmonton lineup is here. 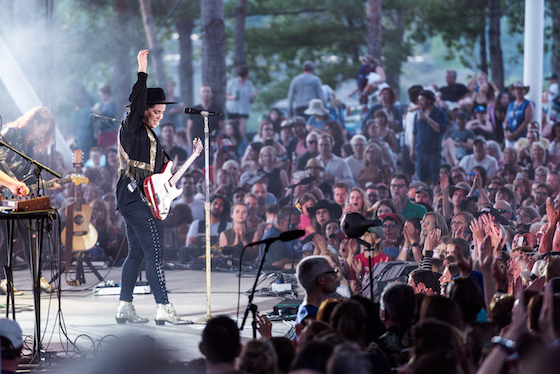 For its seventh year, Interstellar Rodeo Edmonton serves up an inspired, decorated and script-flipping bill that jumps off the page and walks the walk. This year’s headliners include Feist, an incandescent master of mood who brings her new album Pleasure to Edmonton for the first time. Music fans in this city simply cannot get enough of July Talk, an unstoppable, entangled frenzy of bodies and voices on stage and committed advocates for protecting these safe spaces offstage. Interstellar Rodeo is also thrilled to welcome indie rock phenom, poet and guitar shredder Courtney Barnett for her Edmonton debut. By the numbers, this year’s lineup is the most decorated yet, with Grammys, JUNOs, Polaris winners and a long list of other accolades earned by performers across genres. Interstellar goers will be making full use of the dance floor again this year. 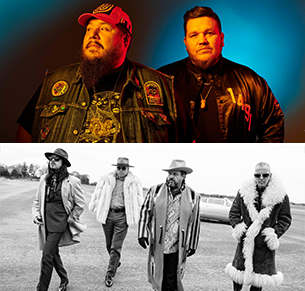 With the big beats, swirling hoops and undeniable power of A Tribe Called Red’s powwow step and the country-Cuban-rockabilly grooves of Nashville’s The Mavericks, who remain as committed to getting the party started in 2018 as they have for the past 25 years, the 2018 festival promises to move you. Interstellar Rodeo has always focused on bringing traditional and progressive roots music to the stage, and this year the festival doubles down on that mandate with Regina’s bluegrass breakouts The Dead South and the iconic a capella gospel of The Fairfield Four, a group that has endured to spread the word for nearly 100 years. If you’re looking for new perspectives, Interstellar Rodeo has a lot to offer. There’s the truth-telling, banjo-punk folk rush of Acadian Lisa Leblanc, already a superstar in Francophone locales. Faouzia, a young Moroccan-Manitoban with an astounding set of pipes and a knack for pop hooks in both French and English, is just on the verge of breaking big. Then there’s the mind-melting mix of hip hop, dance hall and cumbia of Cuba’s cigar wielding, flute-playing La Dame Blanche, who is guaranteed to make an impression. All three artists will make their Edmonton debuts on Interstellar’s stage. Interstellar Rodeo 2018 already promises to deliver on its annual mission to introduce Edmonton music lovers to new artists. On this theme, the festival is thrilled to welcome New York’s Margaret Glaspy to Edmonton for the first time. This young songwriter, who burst on the scene with an album Emotions of Math that wound up on many Best of 2016 lists, has made a huge impact with her astute observational, confessional songwriting shot through with sharp edges of electric guitar. This year, the planets align for another edition of the Interstellar All Stars, a special feature where songwriters take the stage to perform together. This year, Interstellar Rodeo brings east to west with Tim Baker (Hey Rosetta!) and recent JUNO Award Songwriter of the Year nominee Rose Cousins, who will join Regina’s Jason Plumb and his band The Willing. Alejandro Escovedo brings a notable memory of Interstellar’s history at Hawrelak Park; the Texas rock punk icon performed at Interstellar’s inaugural year, in fact its very first day. With their swirling, anthemic indie rock, Calgary’s Reuben and the Dark is also welcomed back for a second performance. Pre-sale tickets available WEDNESDAY, MARCH 7 at 8am MT. Pre-sale tickets will be available to those who purchased a weekend pass to Interstellar Rodeo 2017 in both Edmonton and Winnipeg. Please note that you must be signed in to your account at store.sixshooterrecords.com in order to buy tickets. Weekend passes on sale to the public at 8am MT on THURSDAY, MARCH 8. Tickets available at interstellarodeo.com and at Blackbyrd Myoozik (located at 10442 82 Ave NW, Edmonton, AB T6E 2A2). Interstellar Rodeo’s 2018 lineup was announced at 12pm MT from the ATB Branch for Arts & Culture by festival founder Shauna de Cartier, with a live performance by Jay Gilday. Interstellar Rodeo, now in its seventh year, has fostered a tight-knit community of local business partners, proud volunteers and Alberta’s strongest music champions, who have worked with festival producers Six Shooter Records to build an event driven by the team’s unofficial motto, “Just Be Awesome.” The festival’s unique concept pairs great music with fine wines. https://sixshooterrecords.com/2011/wp-content/uploads/2017/11/17-ssr-logo-home.png 0 0 Sarah https://sixshooterrecords.com/2011/wp-content/uploads/2017/11/17-ssr-logo-home.png Sarah2018-03-06 19:35:212018-03-06 19:35:21THE MAGIC NUMBER: INTERSTELLAR RODEO ROLLS OUT ITS LINEUP FOR YEAR SEVEN.